I am a huge Brunch fan. If there was a contest for the best meal, brunch would win by a landslide in my book. Not only are you allowed to sleep in, but you can do so and not miss all of the wonderful delicious breakfast options. However, if you want to wake up early and eat a small breakfast first, that is ok because there are lunch options at brunch too! And if you want to just go crazy and have two breakfasts, GO FOR IT! You can start out with a nice cup of coffee followed up with Bloody Marys and Mimosas. 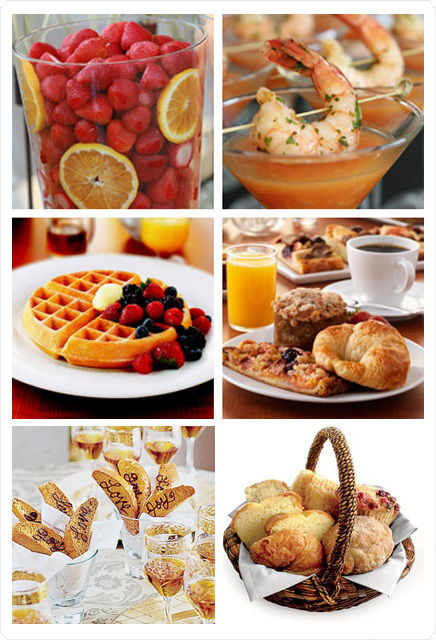 You can eat brunch at 10am (Upper West Side family crowd), 12pm (Midtown and tourists) or 3pm (West Villagiates). There are no rules at brunch. I, first and foremost, love breakfast food. Growing up, family dinners were a nightly occurence in our house. Most of the time my mom did the cooking, but we were expected to help out with the planning. I was a VERY picky eater growing up, which my parents learned very quickly. So instead of constantly fighting with me to eat the food put in front of me, my mom came up with a better solution. Every week before we did the grocery shopping, we all had to suggest 1-2 meals that we wanted to have for dinner. I had 3 “go tos”: spaghetti, hamburger helper and waffles. Breakfast was great in the morning, but breakfast for dinner – as a kid it doesn’t get any better than that (well maybe ice cream for dinner, but that, as we all know, is an anomaly). Working in a school, I have the “benefit” of eating lunch in the cafeteria for free. It is funny because the most dreaded day of school lunches for our office is “breakfast for lunch” day. Clearly, as a kid, I would have loved that. Another sad reminder that I am old! In college, brunch changed from being all about the food, to all about the company. Sitting around the dining hall tables with my best friends, we would catch up on the gossip from the night before. We could make brunch last for hours – especially if we had a paper to write or a test to study for. I miss my college friends the most when Sunday mornings roll around. Living in New York, you have the opportunity to eat at amazing restaurants. While I certainly eat our for other meals, eating out for brunch is my all-time favorite. Just like a band’s performance of the song “Don’t Stop Believing” is my way of judging their ability level, a restaurant’s brunch menu (and the quality of those dishes) is the best way to rate a restaurant. On Sunday Matt and I visited Sarahbeth’s on the Upper West Side. I had been there once before with my parents and Abby, but it was Matt’s first time. The menu has a great selection and I was torn on what to order. Last time I ordered the eggs benedict, so I decided to change things up a bit and I ordered the lemon and ricotta pancakes. Being fron New Hampshire, I am a complete maple syrup snob. While I love pancakes, french toast and waffles, I hardly ever order them at restaurants because they always come with Aunt Jemima or some other nasty immitation syrup. When I was younger I used to bring a small jar of pure maple syrup to sleepovers so that I was prepared for whatever food came my way at breakfast. (Yes, I was THAT kid.) Sarahbeth’s serves all of their “sweet breakfast” dishes with organic maple syrup. Score one in my book! The food was great and the atmosphere almost made you forget you were in New York City. I highly recommend this restaurant for anyone looking for a good brunch spot in NYC. Just remember to make revervations because the Upper West Side crowd certainly gets after it early on Sundays. And if you aren’t planning on visiting the Big Apple anytime soon, don’t worry! They have a location in Key West Florida and an online store: http://www.sarabeth.com/ Sarahbeth’s for all! Next Let the Count Down Begin! I miss nyc brunch with you! !